While Buzz Killer Espresso was a homely sort of place, full of lots of little nooks, Buzz Coffee Roaster & Baker has an austere feel to its décor and layout. It’s long, thin and spacious, with distinct front and back halves, each with its own entrance. The front is on the busy North Milwaukee Avenue, that main Chicago thoroughfare which seems to breed excellent coffee shops, while the rear entrance opens onto West Diversey Avenue. Starting on Milwaukee Avenue, the front is entirely glass, with the door inset on the left, windows to the right occupied by a long, three-person window-bar. The counter is set back on the left, leaving plenty of space for takeaway customers, while over on the right-hand wall, an old workbench doubles as a takeaway station, followed by a small retail selection. The counter has a narrow section facing the door, with the till, coffee options and baked goods, while its bulk stretches towards the back of the shop. This is where the coffee magic happens, starting with the V60s for pour-over, while the two-group La Marzocco espresso machine and its three grinders (house-blend, single-origin, decaf) is beyond that. Opposite the counter is the only other seating in the front section, a long, high, unpadded wooden bench which runs along the right-hand wall with five fixed, narrow wooden tables, complete with well-placed footrests. Beyond this, the space narrows on the right, while on the left, behind the counter, is a kitchen area. Between the two, an open corridor leads to the rear section, with more traditional table seating, the whole area orientated to West Diversey, which is about 30⁰ to North Milwaukee. Entering this side, there are inset glass doors at either end, although only the right-hand one is in use. Between them, a couple of narrow windows pierce the solid walls above a bench with three two-person tables, with another bench along the left-hand wall, this one with four tables. The wall is at 90⁰ to the front, before turning by 30⁰ at the back to align with the other half of the shop. Meanwhile, on the right, there’s a long bench against the wall, but with no tables. Finally, the centre is occupied by an eight-person communal table. While I was there, I met Agnes, one of the owners, who told me that this was originally going to be a second store, but that the original location needed so much building work (including new plumbing and sewers) that fitting out the new place was cheaper than renovate the old one, so they took the decision to relocate. I started with a gorgeous cortado, made with the NCK house-blend. Really rich and sweet, the coffee and milk were in perfect harmony. I paired this with an excellent feta and rosemary scone for breakfast, (currently there’s a limited range of baked goods, but there are plans to expand both the roastery, which is a few blocks away on Diversey, and the kitchen, to offer a more comprehensive menu). Sometimes American scones can be very dry, but this was moist and yet crumbly, pretty much perfect. 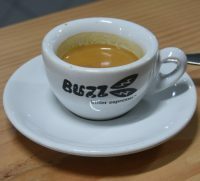 As we chatted, Agnes made me a shot of the espresso (70% Brazil, 30% Colombia). Given how smooth it was in the milk, it was surprisingly bright, a really lovely espresso, with plenty of body and a hint of acidity. As I told Agnes, more of a kiss than a punch in the mouth. In parting, I offered to swap a copy of my book, The Philosophy of Coffee, for a bag of coffee, but Agnes insisted that I took two! This entry was posted in Cafe/Roaster, Cake, Chicago, Coffee Shops, Laptop Friendly, Retailers and tagged Buzz, Chicago2018, include by Brian Williams. Bookmark the permalink.